We have had a fun weekend. We got to go to parks and sniff many trees. Friday we went to the state Capitol. We did not see anybody important. At least, not that I know of. I don’t care if someone is famous or powerful. I only care if they have yummy dog treats. This is a very rare photograph. Not only does it show Daisy and I standing still, behaving, not barking, not digging holes to China, and—wow—not eating anything, all four ears are up! This is especially rare because Miss Long Legs doesn’t like to have her picture taken. My folks have dozens of shots of her walking away, ducking, running nose-first into the camera, or just generally being a blur. It’s a good thing the camera loves me. How I got my name: Before I was even born, my folks had picked out my name. They decided that their dog, whoever it turned out to be, would be named Zippy. Why? Because of a commercial. Cable installer: Good morning, ma’am, I’m here to install your cable. Woman: Cable? [Dog barks.] Zippy, hush!—I’m sorry, but we didn’t order cable. Cable installer: Is this the Anderson house? 123 Cherry Lane? Woman: Well, yes, it is, but we didn’t order cable. [Dog barks.] Zippy, quiet down! Woman: Wow, that sounds wonderful! But really, I didn’t order cable. Cable installer: Maybe it was your husband. It says right here on the order, Z. Anderson. Woman: Z.? My husband’s initial isn’t Z—[in shocked voice] ZIPPY! Woman: Oh, I’m so sorry. He’s already grounded for ordering pizza five times this week. Cable installer: That’s quite alright. Happens all the time. I’ll just be on my way. Woman: No, please come in, we do want cable! [Dog barks excitedly.] We’ll just take it out of Zippy’s allowance. Woman: [To dog] And we’re disconnecting the phone in your room. I have done my best to live up to the proud Zippy traditions. Let’s go around the world to visit some other Corgis. Japan is the home to John-Kichi and Muku and Tantan. We got to drive through a fast-food restaurant this morning. I always like to place my order for “any additional meat that might just be lying around,” but they never seem to understand me, and I have to ask again at the window. I am always disappointed. But my folks always share, so I still enjoy the drive-through experience immensely. It was very cold last night. That made for a good morning to pull my “Cold Nose in the Eye Trick.” Here’s how it’s done. Timing is important. Your folks need to be asleep, but just about ready to wake up. Maneuver to the foot end of the bed. This will get you up to a good head of steam as you race toward your intended target. Aim your nose—the colder and drippier, the better—at the eye of a sleeping People. As your nose impacts an eye socket, do not slow down your stride. Your target will jerk his or her head backward (you think they’d be used to this by now, but the element of surprise never fails while they are asleep), giving you the opportunity to pull off the Grand Prize of dog tricks, the coveted Double Eye Poke. Bonus points! Next, take a step or two back, and sit there, looking adorable. This will help diffuse the shock of being jolted awake, so when your folks can finally unglue their eyelids, the first thing they see will be a smiling Corgi face. Hugs, kisses and breakfast should immediately ensue. Never underestimate the power of sitting on the floor near the table, looking expectant, drooling ever so slightly, and if necessary, reaching out with a paw to softly stroke the leg of a diner who has just a little extra pork chop. Or starting a blog to win a highly coveted Blorgi award. I think the bottom rung of the Dog Hierarchy was written about my folks! Except they don’t make me wear sweaters. Anymore. My legs are too short for the arm holes, and so I kind of wiggle one leg out of the hole up into the sweater, then I fold like a card table onto my face. It’s the most undignified thing. Now, I would never actually bite my folks, but when it comes to sweaters, I let them know I could bring out the heavy artillery if I had to. If a sweater is even unpacked for cleaning, I get very moody. If a sweater is brought into my general area, I emit a low warning growl. If there’s any reference to “Let’s see if this still fits him,” it’s a mad dash out the dog door into my private yard where I seethe until my folks pack the awful, hateful thing away again. Hey, a guy’s gotta draw the line somewhere. I am the happiest dog in the world right now! Daisy and I got to ride in the car and go to the creek. We found a place where someone had cleaned a fish and we rolled in all kinds of fish guts. We stink! I mean, we positively reek! It was a few degrees above freezing, but we rode back with all the windows rolled down. I want to go transfer this wonderful scent to the bed, but some mean People has closed the door to the bedroom. Hey, do I hear water running? Is that the tub filling up? My folks have discovered that Bob the Corgi will be awarding something called a “Blorgi.” And so, my folks have encouraged me, Zippy, to begin an online journal to be eligible. I can’t believe I caved so easily. I guess I really want to make my folks happy. If I make my folks happy, maybe I will get more treats. So I see it as a win/win. I don’t know if Bob the Corgi is really a Corgi. I think Bob is a People. And a She People, which makes the name Bob kind of interesting. 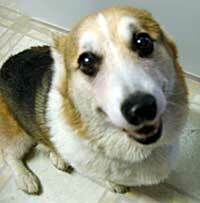 Maybe the She People just likes a Corgi named Bob so much she has taken on Bob’s personality. (It could happen.) This Bob seems to mention food a lot, which makes me think Bob really is a Corgi. Or at least a very good honorary one. Well, anyway, I, Zippy, will be writing in my Journal now and then. Hopefully enough to win a Blorgi in the category of “Real Corgi Who Created a Blog Just to Win a Blorgi.” Since Bob seems to be willing to make up categories as this goes along, I am encouraged.